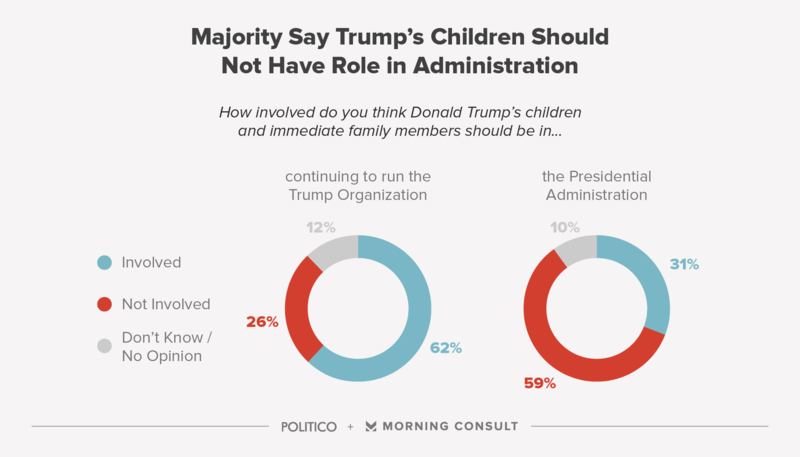 Most voters say Donald Trump’s children should be involved in running the Trump Organization, not his administration, according to a new Morning Consult/POLITICO poll. The national survey, conducted from Nov. 16-18, shows that 62 percent of voters say Trump’s children should have a role running their father’s business while he is president. By contrast, nearly six of 10 voters (59 percent) say they should not be closely involved in the Trump administration. There is speculation that Trump’s eldest children and his son-in-law Jared Kushner could be tapped for senior roles in his administration. Furthermore, there were reports that Trump is seeking top security clearances for certain family members. 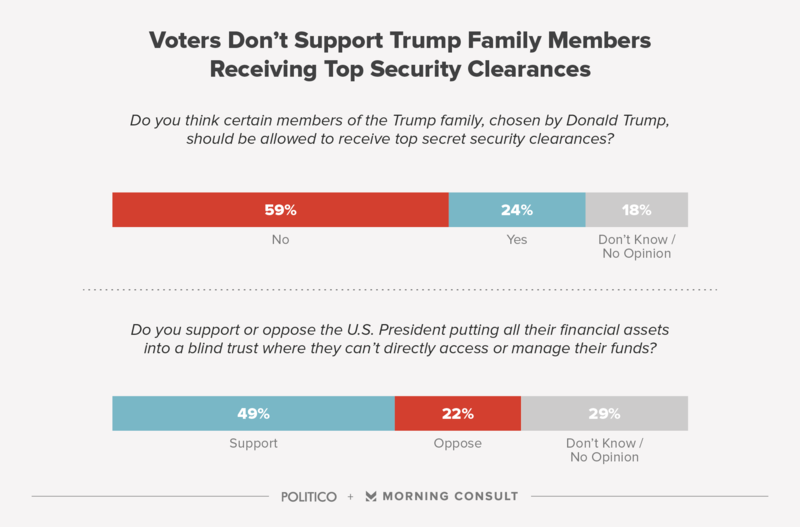 A majority of voters oppose that idea, with 59 percent saying Trump family members should not get top security clearances for certain family members. Twenty-four percent of voters said they should. Most voters said they have not heard of or have no opinion of Jeff Sessions, the Alabama senator who President-elect Donald Trump selected Friday to serve as his attorney general. Sessions is unknown to 39 percent of registered voters, and another 23 percent said they know of him but have no opinion. Only 18 percent of respondents said they view Sessions favorably, while 20 percent said they have an unfavorable opinion of him. 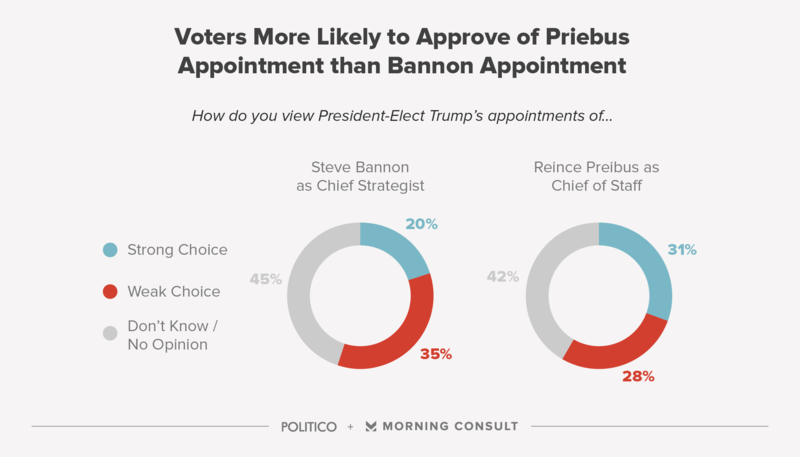 The poll also shows that most voters (52 percent) have not heard of Trump’s choice for chief of staff, Reince Priebus, or his pick for chief strategist, Steve Bannon. 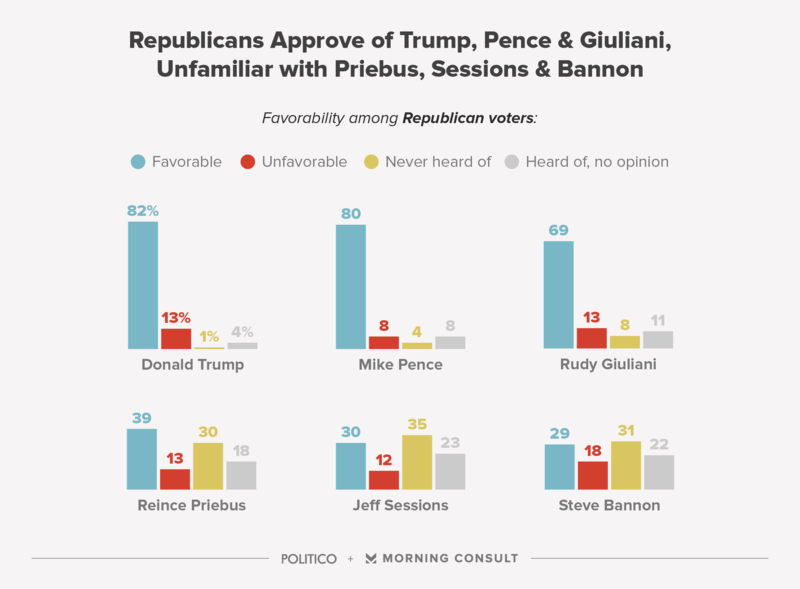 Voters were less favorable of Bannon’s appointment. Nineteen percent of voters said the selection of Bannon, the chairman of the website Breitbart, is a strong choice, while 34 percent said it is a weak pick. Bannon’s selection has been highly controversial, with Democrats and some Republicans raising concerns about his nationalist views. Thirty percent of respondents said Priebus, the Republican National Committee chairman, is a strong choice for chief of staff, while 27 percent said he is a weak choice. Voters were also asked about Rudy Giuliani, who is reportedly in the running for secretary of state. The former New York Mayor, who was in office during the 9/11 attacks, is unknown to only 9 percent of voters. Forty percent of voters said he would be a strong choice for secretary of state, while 36 percent said he would be a weak choice. Trump’s popularity has increased since he was elected president. In a Morning Consult/POLITICO poll just before the election, 37 percent of voters said they had a favorable view of Trump, while 61 percent reported an unfavorable view of the then-candidate. After the election, the number of people reporting an unfavorable view of Trump dropped 15 points, to 46 percent. Trump also saw a nine point increase in voters saying they had a favorable view of him, also to 46 percent. The poll consisted of 1,885 voters and has a margin of error of plus or minus 2 percentage points. Full results are available here.